No other award beats the SHINE and SPARKLE of a brass award! 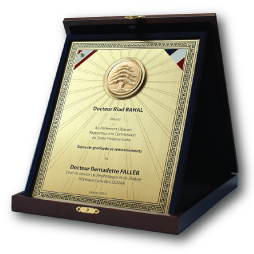 Our standard brass plaques are engraved from brass sheets in a process that offers very precise high quality engraving. You can choose from more than 40 different templates and personalize it with your logo and text, or send your own layout and design. The design elements (black areas) are sunken into the plaque and are color-filled manually (the color fills the engraved grooves and areas). Every minute detail in your design is etched. The standard finish on an etched plaque is a satin belt on the raised areas and a painted recessed background. 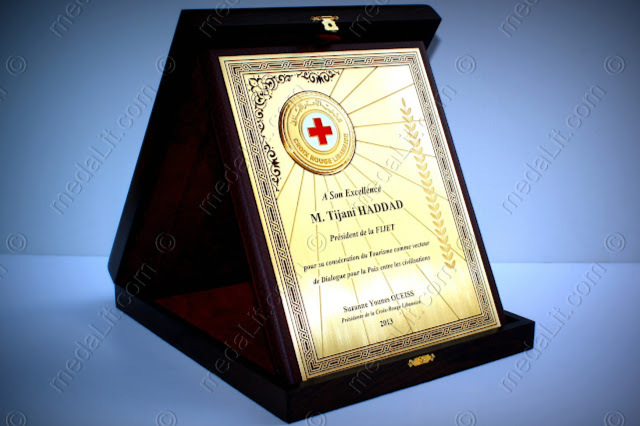 All metal plaques receive clear protective coating. Two more finishing types are available: the brilliant-finish and the antique-finish. The plaque is mounted on a wooden stand covered with velvet. It is treasured in a luxury wooden box with interior covered with the same velvet color. Available colors for the velvet are: dark blue, dark red or dark green. The color of the wood frame of the box is vengé (very dark brown).